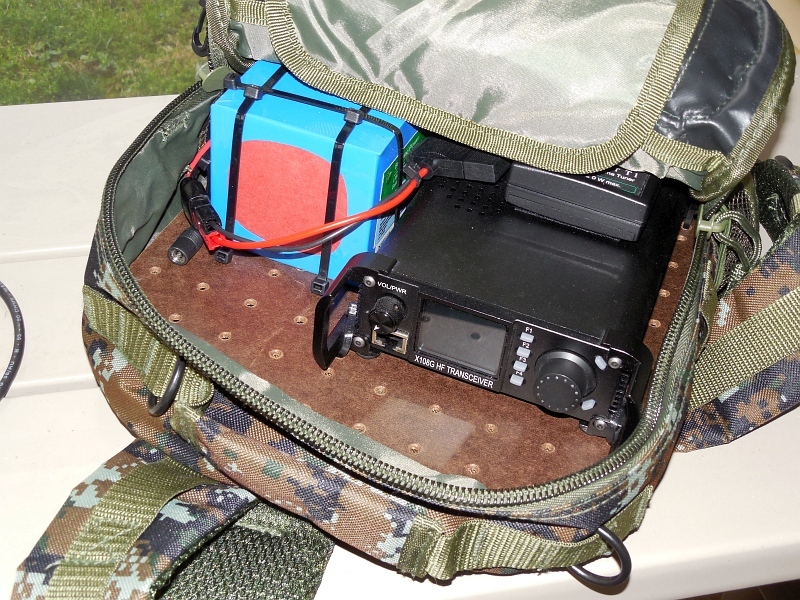 Xiegu X-108G HF "Go Bag"
Over the winter I purchased a Xiegu X-108G HF transceiver for portable operations. I have an Elecraft KX-1 which is fantastic for "CW Only" operations but a lot of times I like the ability to do SSB and also operate more bands than the KX-1 covers. I wrote a little about the X-108G earlier in my Winter Field Day post. 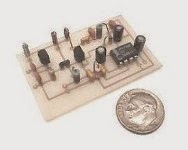 The basic info is it covers 160M to 10M (AM, SSB, and CW) and has power output which is adjustable from 0.1W to 20W. In my opinion reliable SSB operation usually needs more than 5W and I find that 15W or so works really well. *I plan to put some sort of rubber or foam ring around the two buttons on the tuner. I did not notice any problems today but I don't want the pack to hold them down and drain the battery while traveling. These three items are all mounted to a thin piece of masonite peg board, maybe 1/8" thick, using nylon zip ties. The tuner is attached to the radio with Velcro for ease of accessing the battery. This method with the zip ties isn't especially pretty but I've found that an awful lot of my projects spend their lives in "beta test" mode as I constantly tweak and tinker with the designs trying to achieve the elusive "just right" configuration. The reason for the corners of the masonite being chopped off will be obvious shortly. Everything I need to go portable fits in a small backpack with the exception of my collapsible 28-foot kite pole. The top of the pack I chose is slightly rounded so I trimmed the masonite base so it would fit easily. Although it might be possible, I don't plan to operate the radio in the pack. With higher power comes more heat. I spaced the radio up off the board to provide some airflow but being inside the pack would prevent that from doing any good. Besides I need to get to the antenna connector on the tuner. Here's the station all buttoned up and ready to travel. The outside pockets of the pack hold the X108G's microphone, a small set of paddles, a 9:1 unun and wire for the antenna. There's also a small notebook, pen/pencil, and a pocket knife for "field repairs" if needed. 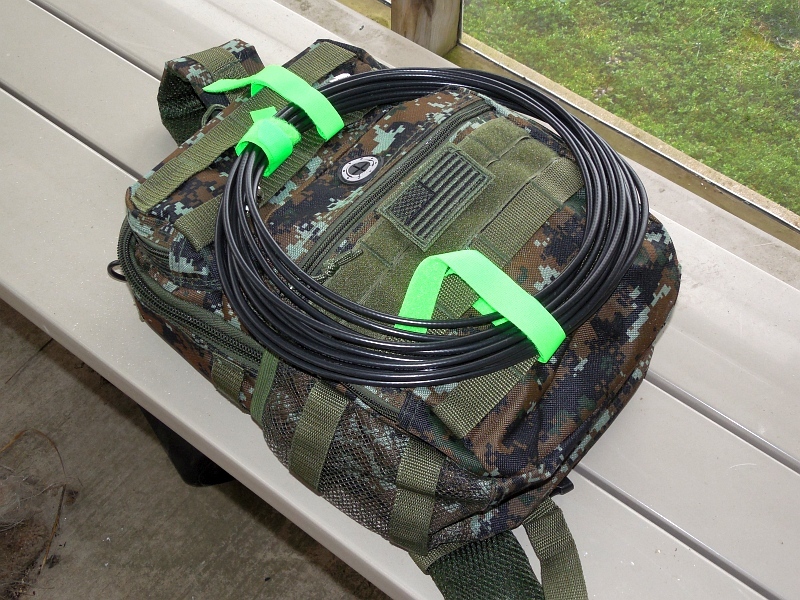 A 25ft length of RG-58 is coiled and attached to the outside with velcro. That length coax provides an adequate counterpoise for the antenna. The coax will actually fit in a thin pocket that is the same size as the entire pack. I ended up putting it on the outside because it was just a lot easier. This afternoon when I was trying things out in the back yard with a 30ft wire I was able to get a low SWR on 40, 30, 20, 17, and 15 Meters. 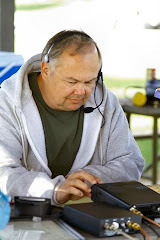 The WPX contest was going on and I made contacts on 40 and 20 Meters without any problems. Ozarkcon 2017 Is Nearly Here! 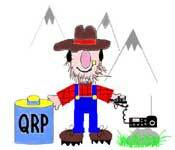 Each year the Four State QRP Group puts on a QRP convention called Ozarkcon in scenic Branson, MO. This year's event will be held April 7-8, 2017. Ozarkcon is a great, relaxed time. It has a swap meet, a day of presentations, build-a-thon, etc. to keep the fun pumping. Branson has plenty to do for spouses or kids not interested in QRP and best of all since it's "off season", room rates, etc. are very reasonable. More info on the Qzarkcon Web Page. I'm not sure why but it seems every time I post here, on Facebook, etc. someone always contacts me and wants to know about my station. It isn't bare bones but considering I've been at this for 40 years now I still think it's modest but functional. Note there are no VHF/UHF FM items listed here. I change those too often and in general I think they are mostly a matter of which one you like the looks of the best. 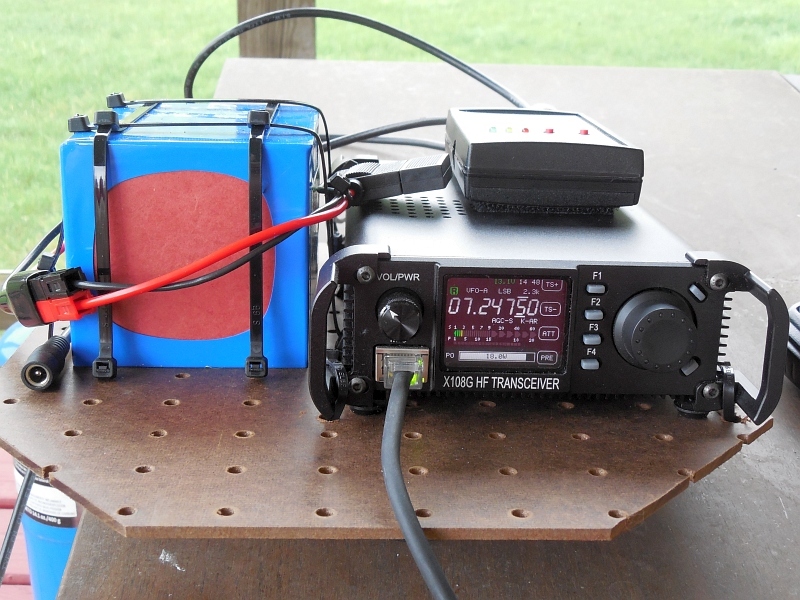 HF is my favorite part of amateur radio. - 80 Meter Inverted V w/Balanced Line feed. No, this isn't every piece of gear I own but it's the major stuff. I have a few odd small tuners and accessories tucked away here and there along with some test equipment but I'm too lazy to get all of that out and inventory it. By and large these are the things I use regularly. I remember being all excited years ago with the notion of a 40 Meter transceiver kit that could be had for the princely sum of about $15.00US! I recall buying the kit but never built it. I let it age on a shelf near my bench and ultimately sold it at a hamfest. Well, a few years have gone by and the venerable Pixie lives on but in an updated version. While most ham gear has gone up in price the Pixie has actually gained an enclosure and gone down in price. You can buy an assembled Pixie in a case on eBay for around $8.00US as I write this. Oh, that price includes shipping by the way. 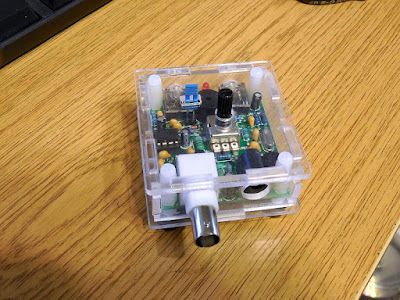 In theory, one could claim that if you changed the crystal to somewhere a Technician has 40M HF privileges, added a simple dipole tuned for the Pixie's crystal frequency, an inexpensive key, 9V battery, and some earbuds a person who puts in the effort to learn Morse Code could get on HF for under $15.00US. While that's technically true I absolutely do not advise this as a plan to get into ham radio cheaply. The reality of the situation is that operating a very lower power transceiver on a single frequency with little to no CW skills and experience would be, in my opinion, a recipe for frustration and disappointment. None of that of course means you shouldn't get a Pixie. If you have some modest skills or a couple of friends who live nearby it could be a lot of fun. If your operating skills are up for it you can probably make a lot of contacts. I mentioned changing the crystal. The Pixie comes with a frequency of 7.023 MHz which is in the US Extra Class allocation. While you could certainly operate there as an Extra I'd recommend you switch it out to the more common 7.030 MHz QRP "watering hole" or even move up the band to around 7.122 MHz where there's quite a bit of slower speed CW activity. Things are a lot more casual there. As for the crystals, one supplier I've had great success with, and who has great prices, is KC9ON's 3rd Planet Solar site. He sells crystals on many of the common frequencies for just a $1.00US each and ships very fast.